Your Kindness Can Change The World! This is the best place to find outreach resources that help you show God's love in practical ways to the people in your community. Our products will help you and your church to practice servant evangelism in your neighborhoods and city. We have been pioneering servant evangelism for over 30 years, and these resources are a result of our experience. Please contact us for info! What Are Connect Cards And Why Should I Use Them? These cards are used in conjunction with servant evangelism (SE) outreach. We truly believe that small things done great love, will change the world. And you will often see these small acts of kindness change the lives of those you come in contact with.... These cards, which are given out to those you serve, explain what has been done to them. 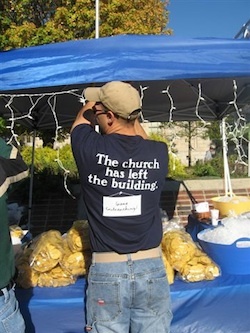 The act of servant evangelism outreach projects is a rather hit-or-miss affair. That is, sometimes you will have complete conversations with those being served, and other times you will simply not have the opportunity to converse adequately. It is important that those being touched with these acts of kindness have some means of getting back in touch with you if they so desire. The point of giving out these cards is to “connect” with people in your communities. Connect cards are necessary in life in our trek toward being memorable. Without using a kinetic art of some sort to help us make a connection with those we are coming in contact with, the result is that we and our cause will meander through life not making an impression. Thus is it utterly necessary for us to give those we come in contact with a connect card once we have made any sort of connection with them. For us to make a statement of truth about the cause we are associated with, the matter we are living for, but then to fail to give provisional help to the people we have spoken with that allows them to go online or to email us for example is to miss an essential fact of life. Life is about playing with a full deck of cards. We must deal with reality. This is not the time to express an idealism that might resist giving away connect cards in general. Connect cards help up your “stick” factor. In the name of stickiness you and I need to have some means for other people to latch onto what it is that we are up to. Stickiness is the notion and that each of us as something worthwhile to impart to others. To have a meaningful a counter was someone where an exchange of ideas occurs by necessity there must be a connect artist of sorts left behind. If the connect card is not given, the encounter will be a mere “passing of ships in the night”. There will be no lasting effect. We will in fact do nothing more than cause the other party to grow in anxiety because we have whet their appetite for more information but by not leaving a connect card we have left them with no option for following up on what we have chatted about. When doing a large servant evangelism (SE) project, there is often a need to distribute large volumes/high numbers of connect cards. For example, if you are going to do a water bottle outreach, then a water bottle connect card is going to clearly convey what you are doing and why. They won’t soon forget the connection! You are looking for something simple, to the point and with enough information that someone can the read card and gain plenty of information about what was not conveyed verbally. In large outreach/giveaway settings such as a water bottle outreach at a sporting event, there is a severe limit on what can be said because there are lots of micro-conversations that will take place. There will be few conversations that will last longer than say, five or 10 seconds. In such cases it is necessary to have a whizbang connect card that will convey the group’s intentions that day in order to adequately indicate who they are, what they’re up to and where they can be reached. In order to put together an engaging card, you need to put yourself in shoes of the person who will ultimately be reading the card. Who are you looking to reach with your outreach events? Not yet believers? People that have had bad “church” experiences? People in need? People looking for a church to call home? though this is a short and sweet conveyance that will be read by the person receiving the note the name of the game is to get into the emotional pocket have the person that is reading what we have to give away. We want to come across as a friend immediately. Quite often in settings like this language is used that is awkward, technically accurate but unclear to the reader. It is always preferable to have something that is clear and simultaneously offputting. That is, it’s always a bit better to come from the angle that we will choose language that is understandable by the person who’s reading it than to choose language that pleases the person who’s paying the bills on our end. It’s often necessary to go back to the bill payers or accountants on our end of things and to explain to them that effectiveness is far more important than technical accuracy with such things. I’m not sure what the world record is for someone holding onto a connect card and then ultimately coming around full circle and acting on that original contact that was offered. Surely it is many years at least. I know of a number of stories that extend over many years. It is an amazing thing to see the magnetic effect that occurs when a bit of care is extended to someone, a card is given to them as a result and it ends up changing the persons life. I wonder if it would be feasible to write a book someday about the awesome power of a simple connect card that makes its rounds and in due time changes the world.